You’re viewing the archived ice cream ratings for 2016. Follow the link for current ice cream ratings. 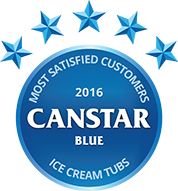 Canstar Blue research finalised in October 2016, published in November 2016. Much Moore scoops five stars in Overall Customer Satisfaction. Ice cream. It’s been around for thousands of years and we still love it. Obviously, it’s evolved quite a bit since the early days and even though it didn’t hit New Zealand shores until sometime after 1800, we’ve become a nation of ice cream connoisseurs. In fact, according to the New Zealand Ice Cream Manufacturing Association, New Zealanders have been ranked as the biggest ice cream lovers in the world, annually consuming an average of 23 litres per capita! For most of us, the Kiwi institution that is Hokey Pokey is still king, although according to our survey, Cookies and Cream is creeping up the rankings and is a firm favourite with younger generations. Generally speaking, ice cream is a combination of milk, sweeteners, plant-based stablisers (usually corn syrup) and sometimes egg. These key ingredients are whipped together in a mixing tank where the products are heated and pasturised to kill off any germs. The mix then passes through a homogeniser to break down the fats to give ice cream a smooth texture. The mixture is then cooled to around 2 degrees and is left to partially thicken into a paste. Once the ice cream has thickened, any flavours and sweeteners are then added. The final product is then poured into tubs and stored in a freezer to harden before being shipped off to your local supermarket. Of course, this is a very general explanation and each company will have its own unique methods. Much Moore is a family owned New Zealand ice cream company which produces a broad range of ice creams and ice blocks. Signature Range ice cream is the premium brand from supermarket Countdown. This range includes a number of traditional and fruity ice creams. Deep South is a New Zealand owned and operated premium ice cream producer that operates from the foothills of the Southern Alps. It produces over 40 flavours of ice cream. Kapiti offers a wide range of ice creams and sorbets. It promises rich textures, unique flavours and a perfect indulgence. Killinchy Gold is a premium ice cream company. It offers 17 unique flavours of ice cream and sorbets. Movenpick produces a premium range of Swiss ice creams and claims to use only the finest ingredients with no artificial colours of flavours. Tip Top is an iconic New Zealand ice cream manufacturer that produces many Kiwi favourites, including Trumpet, Fruju, Jelly Tip, Choc Bar and, of course, Hokey Pokey. Cadbury produce a huge range of sweet treats, including a range of rich ice cream tubs, bars, cakes and sundaes. Pams is a New Zealand based producer of a wide range of food products, including a modest range of ice cream. Select ice cream is a Countdown brand offering a wide range of flavours. New to the market, New Zealand brand Lewis Road offers strawberry, vanilla, double hokey pokey and chocolate in their premium range and rose flavor in their artisan range. Canstar Blue commissioned I-view to survey 2,500 New Zealand consumers across a range of categories to measure and track customer satisfaction. The outcomes reported are the results from customers who have purchased and eaten ice cream tubs in the last six months – in this case, 2,009 New Zealanders.